As soon as you start earning paychecks, which should be in your teens and 20s, you should ideally start saving for your retirement. Savings are often considered a journey, not a sprint; so the earlier you can start contributing to your future savings, the more time your money has to grow, and the better off you’ll be in the long run. Unfortunately things are not so straightforward! Young people in their 20s often have to deal with many financial costs, including paying off student debt and credit card debt, and when they manage to save, it is for travel, a car, or a down payment on their first piece of property; so saving for retirement is usually nowhere near the top of their list of priorities. It is unfortunate that many young adults don’t know how to manage money, yet they’re quickly accepted for credit cards the instant they turn 18. The result is a huge credit card debt that interferes with their future plans. But with early financial education, people can make sound financial decisions and start saving at an early age. Financially savvy young adults recognize the merits of starting a long-term savings plan, because they have decades to compound the amount. Compound interest, or interest on interest, can have remarkable results when you start saving early. Consider making a single $10,000 contribution into a tax-free savings account (TFSA) at the age of 18. By the time you’re 65, that investment will have grown to $257,000, assuming a seven percent return during the period. Basically, the amount doubles every 11 years. So by starting early, you have the advantage of doubling your money a number of times. 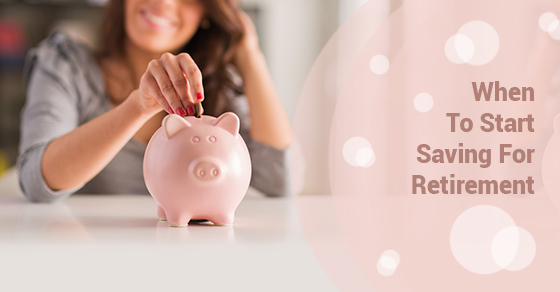 When you start saving early, it is better to do it via a tax-free savings account than a registered retirement savings plan (RRSP) because your 20s are likely to be low-earning years and you won’t benefit as much from the tax break offered by RRSPs to high-income earners. Many young adults don’t put much thought and energy into saving for retirement, but that makes it all the more important that they be educated on investing, financial planning and risk. Generally, you should make investments depending on your stage of life, and younger people have a chance to take greater risks. For instance, investing in a two-percent guaranteed investment certificate (GIC) while in your 20s does not give you the potential upside you’re entitled to. If you’re still grappling with your finances and haven’t started saving for retirement, consider getting professional financial advice. The professional help will guide you towards creating a financial plan that makes you aware of what is happening with your money at all times.